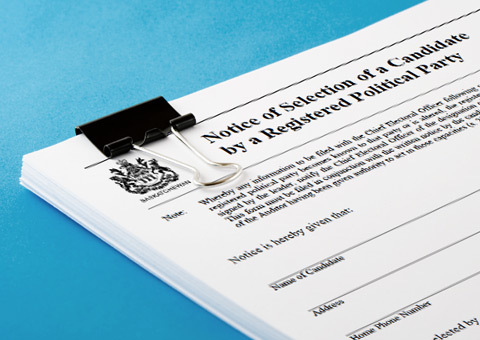 In all Canadian jurisdictions, including Saskatchewan, there are certain requirements to run as a candidate at an election or to establish a registered political party. Before seeking nomination or being a candidate in a provincial election or by-election, it is your responsibility to ensure you are in compliance with any policies or guidelines established by your employer with respect to political activities. For example, if you work in the federal, provincial or municipal sector or hold a public appointment or office, there may be legislation related to employee participation in the electoral process. In Saskatchewan, any person who meets the requirements of The Election Act, 1996 can become a candidate. A person may be either a potential candidate of a registered political party following a nomination contest, or they may be endorsed by the party anytime between elections. A person may also register as an independent candidate anytime between elections. Between elections, a person who is interested in becoming a potential candidate should complete the pre-writ forms and submit them to Elections Saskatchewan. Whether or not a person has been nominated by a registered party, or intends to run as an independent candidate, the person must be officially nominated as a candidate after the call of an election or by-election in accordance with the Act to be eligible to run for a seat in the Legislative Assembly.